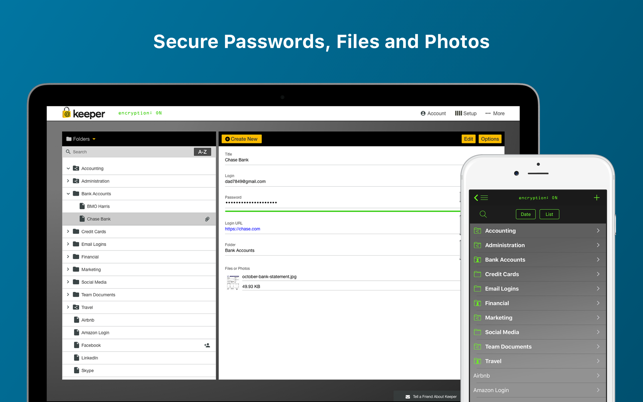 Stay protected with the world's #1 most downloaded password manager & secure digital vault. 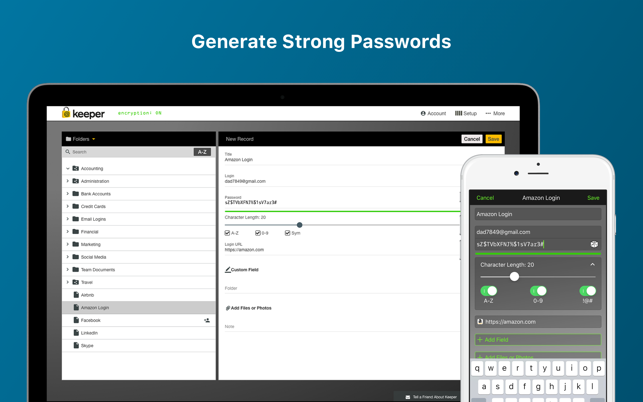 Keeper creates and stores strong passwords and auto-fills them on any of your devices. 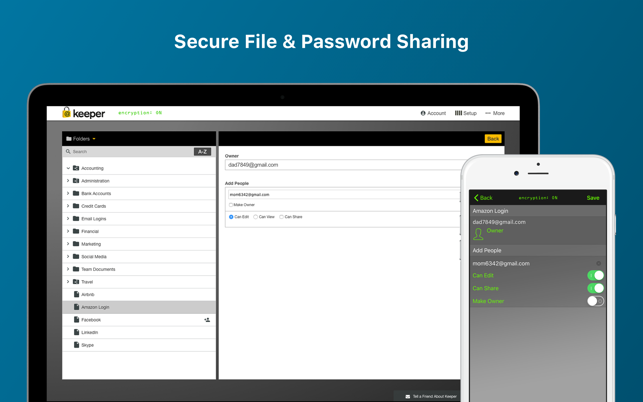 Keeper also locks your private documents, files, and photos in a secure encrypted vault. Don't get hacked. Get Keeper. Join the millions of people who use Keeper’s world-class security to safeguard their personal and professional information from hackers and cybercriminals. Keeper Unlimited is a 1-year auto-renewable subscription for $29.99/year. Keeper Family Plan is a 1-year auto-renewable subscription for $59.99/year. Secure File Storage is a 1-year auto-renewable starting at $9.99/year. You can turn off auto-renew up to 24 hours before your next subscription payment is due via your App Store settings page. U.S. Patent No. 8,656,504, 8,868,932 and 8,738,934. 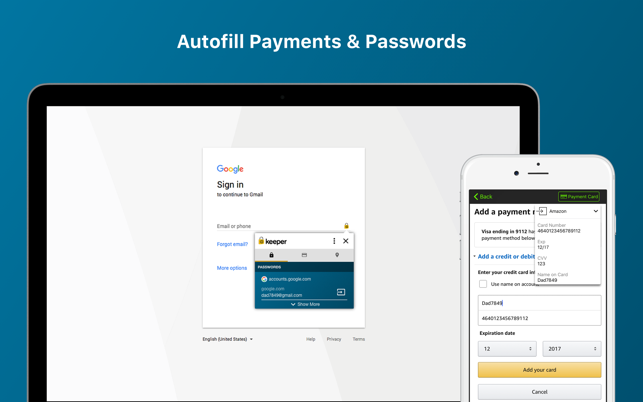 • New account creation process to enter your passwords more efficiently. • Keeper’s new Emergency Access feature grants access to your account for up to five trusted family members or friends in the event of an emergency. 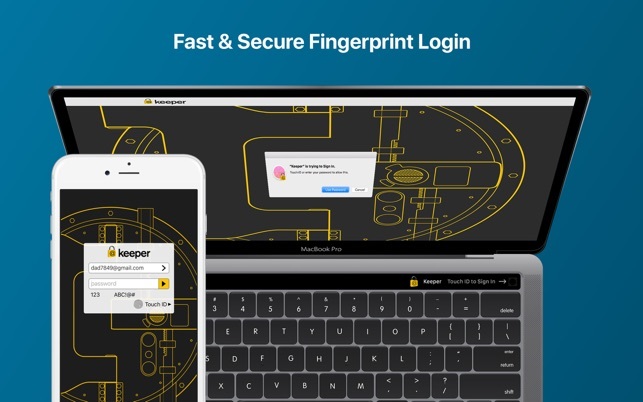 I purchased Keeper because of its vault security and ability to span that secure vault onto my three devices, MacBook Pro (2014), iPad2 and iPhone7. The secure vault is available across devices, however, in one iPad and two iPhone instances, two-factor authentication does not work. On the Mac, several 2FA options are available which may function on other devices, but not the Mac. Also, the user interfaces are terribly inconsistent across devices. It appears that most of the product work went into the iPhone and less into the MacBook Pro and iPad. On all devices, there is no indication that the addon Breachwatch is executing, nor is there any explanation how you are notified when a breach occurs. On the Mac, if the vault uses folders, they do not appear in the autofill window; and the autofill records are not in the sorted order organized in the vault window, forcing an autofill search. On the Mac, after drilling downward in Settings, reversing the traversal upwards does not always show all the windows that were shown in the downward path. On the Mac, when saving a Chat session, there is no validation of the send-to email address, and the session can be lost. Keeper's Chat analysts were helpful but Support’s responses to emails concerning the above issues were mostly without replies. While I believe Keeper is a bunch of young enterprising folks, they need some help in customer service performance. HOWEVER…that said, I think Keeper is a real plus for someone like me with hundreds, OK maybe a hundred accounts with user name and password I have to keep an updated list. But with Keeper I just put in the info and done. Most of the time, some sites like Bank of America often times will not accept my browser, Safari… but then the bank itself is useless. I would not put your money in it! I had a few problems like upgrading and everything duplicated…that drove me nuts having to use the Chat room. Give me a phone number and a person and it would be done in 5 minutes, not several hours…Over all good deal! After almost 4 hours of diligence and chat help, which disappeared at the worst possible moment, all I have is a usless account with no prospects without manually entering dozens of passwords. And the probablity is great that even doing that will come to naught. The probability that this app will be accessable and useful seems lower than the probablitlly that the Apple Genius will not delete my entire photo library and cause hundreds of duplicate contact entries and other files. Said Genius did those things on more than one occasion and then explained to me that it was all normal to expect, in the rare instances possible, me to pay high fees to correct problems that I did not have before consulting them. In this drama with Keeper, Shella on Chat seemed to be following my line of inquiry but did not seem aware that the act of opening 1Password would instantly close her down along with all contact with Keeper. And following the instructions to import from 1Password and Chrome, as best could be approximated from the confused menus and nomenclature, has increased my list of imported login cites from 2 to 7.. All 5 of the new ones have zero inteligable login information and seem to have language that goes back before I ever used 1Password. © 2017 Keeper Security, Inc. Patents Pending.